A framed hand painted paper honour roll commemorates those who served in World War One. It lists 31 names. 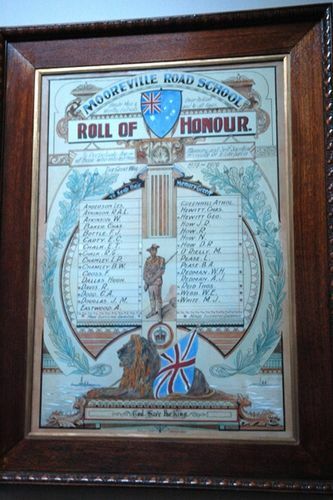 An impressive ceremony took place at the Mooreville State School last night, when the honor roll, bearing the names of former scholars of the school who had served in the Great War, was unveiled in the presence of a large number of residents. The words: "To perpetuate; the memory and self sacrifice of those who enlisted from Mooreville Road to take part in the Great War, 1914-1919, appear above the names, which appear in bold letters. The roll was covered by a Union Jack, and the unveiling ceremony was performed by Mrs. A. G. Chalk-one of the many mothers who lost a son in the Great War. Advocate (Burnie, Tas), 19th October 1921.